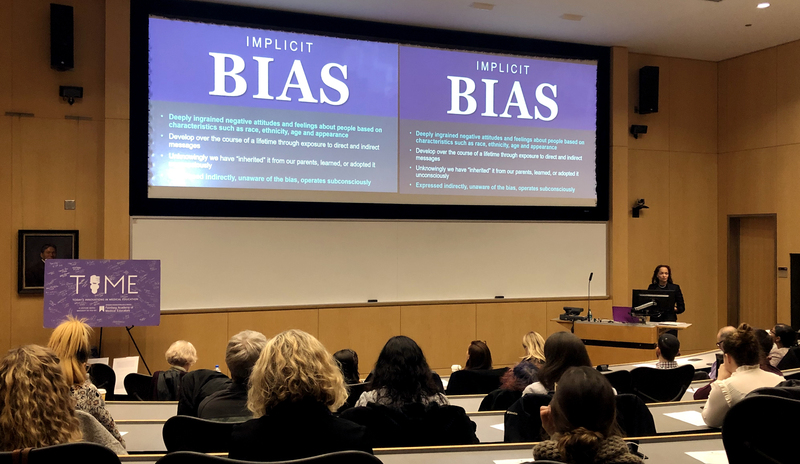 The solution to reducing implicit biases in healthcare starts with self-reflection, explained Dana Thompson, MD, MS, chief of Pediatric Otolaryngology in the Department of Otolaryngology – Head and Neck Surgery, during a recent Today’s Innovations in Medical Education (TIME) lecture. During the lecture, Thompson defined implicit and explicit biases, discussed the negative impact of biases on both patient care and physician burnout, and shared advice for clinicians and educators. She also answered questions from a large audience of Feinberg faculty, trainees, students and staff. TIME, sponsored by the Feinberg Academy of Medical Educators (FAME), is a monthly lecture series dedicated to highlighting technological advances, new pedagogy and best practices in health professions education. Reducing implicit and explicit biases is critical for improving the future of healthcare, Thompson explained. “Our biases unfortunately get in the way of creating a diverse workforce. And why is diversity important? Because the world is becoming a lot more complex. We need all kinds of mindsets to really think about how to innovate and problem-solve. Diverse groups are better at solving complex problems,” Thompson said. As part of the discussion, Thompson also provided an overview of her own medical career and experiences as a physician. “My presence has really represented change in nearly every environment I’ve been,” she said. Thompson completed her residency and fellowship training at the Mayo Clinic, where she was the first African-American female consultant in surgery. She went on to become the first African-American woman to serve as division chief in otolaryngology and the first African-American president of an otolaryngology academic surgery society. Using specific case studies from her own career, Thompson illustrated how best to manage instances of implicit or explicit bias from a patient.